Whilst it’s common knowledge that the famous poet, novelist, playwright and intellect was imprisoned for being gay, the events that transpired in 1895 which resulted in Oscar Wilde’s sentencing to two years hard labour, are widely unknown. This dramatic sequence of events began with a scribbled note left with a club porter and ended with Wilde’s loss of freedom, and the European Arts Company present the libel and criminal trials that ensued with talent, respect, and creative flair. In February 1895, Wilde takes to the stage to crowds of applause after the first showing of the play The Importance of Being Earnestis an overall success. At the top of his game, the Irish artist boasts a double first from Oxford University and is no stranger to fame and riches. Chaos ensues after his close friends’ father, The Marquess of Queensbury, leaves a note at his club accusing him of ‘posing as a somdomite’. Despite the misspelling, it was clear that he was accusing him of acting as a sodomite, having learnt the true nature of his son’s relationship with Wilde. At this point in history It will take over 70 years for homosexuality to become legal in the UK, so Wilde attempts to sue Queensbury on the basis of libel of character. Throughout cross-examination in the libel trial it becomes apparent that these accusations were true. Within the very same day, Wilde drops charges of libel against Queensbury and is arrested for ‘buggary with mankind’, to be instantly incarcerated awaiting the criminal trial which he will eventually lose. The production plays out the two trials based on transcripts found and exact words used in these proceedings- act one of the show is the libel trial, and act two is the criminal trial. Initially sceptical of the entertainment value of a prosecution, the show is in fact extremely captivating- comedic whilst still playing an important part in making its audience aware of the severe injustice of the situation. The script, co-written by Wilde’s grandson Merlin Holland, is intelligent and witty, thanks to the intelligence and wit of its lead character. Wilde’s words are used wherever possible, and the timing and deliverance of his replies and taunts is extremely engaging. 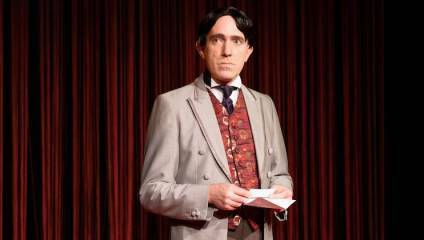 The stand-out element of the show was the performance of Oscar Wilde by actor John Gorick. Gorick appeared to be extremely at home in the role, and played the character confidentially, with a perfect balance of the effeminate artiste and the self-assured intellectual. He outwits lawyers, creating holes in their prosecution and turning every question on its head. As his story begins to unravel, he expertly represents the slip-ups, stumbles and lies that turns his luck. Three other cast members rotate costumes and props to play the other 13 parts, utilising dark stage space to reduce time spent going back and forth to the backstage area. Whilst it’s never exciting to see a cast made up entirely of men, the strong, small cast pull it off, despite one or two over-acted caricatures of smaller parts. The stark contrast of tone at the start and the end of the play is expertly created. Beginning with the jubilation of a successful production, Wilde’s fall from a place of confident exertion happens steadily throughout the first act. As the defence lawyer in the libel trial questions his relationships with young men Wilde believes he can outsmart him, which sadly doesn’t end up being the case. Tension is built throughout act one as their discussion becomes more and more heated, and Wilde slowly becomes more and more agitated. Act two begins with a heightened sense of solemnity. The jokes and witty lines are reduced, and the theatre is anxious with the sudden weight of the situation. The show ends with a well-deserved applause, yet the audience is left with a strong feeling of desperate injustice, for not just the lead character but the thousands of British men who were condemned for their sexuality in our countries history. Overall, a must see for the many fans of Wilde’s work, and an important history lesson on the homophobia of society in our recent history.